Hannah J. 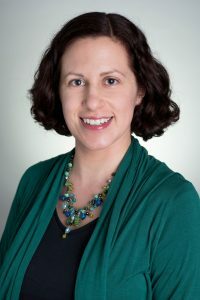 Block, assistant professor of kinesiology in the IU School of Public Health-Bloomington, has been awarded a research grant from the National Science Foundation to investigate the intricate relationship between how individuals perceive their surroundings and how they operate within those surroundings. To perform a voluntary movement-for example, reaching out to pick up an object-the brain must plan such motor parameters as movement direction and extent. The movement will not be effective unless the brain correctly perceives hand position, ascertained through a combination of information gained through such factors as vision, body position sense and touch. Although this flexible “multi-sensory integration” can change with learning, it is not known whether or how these individual processes interact. “Reciprocal Effects of Adaptation in the Brain’s Motor and Sensory Systems”-funded by a total budget of $549,519 over three years-will examine how sensory and motor regions of the brain interact to acquire new patterns of movement. “This project will help us understand how best to teach people new motor skills, and how to develop better prostheses and other technologies that depend on human sensorimotor control,” says Block. To achieve the project’s objectives, the team will collect behavioral and neurophysiological data from healthy adults, using a two-dimensional virtual reality apparatus that allows the investigators to present stimuli about the hands in a way that seems realistic to the brain. In some cases, subjects will be asked to indicate where they perceive the stimuli to be positioned; in other cases, they will grasp the handle of a robotic manipulandum and move it to a target while subtle forces are applied to the hand. These methods let the researchers both alter and measure the participants’ sensory perception and motor control. The neurophysiological methods involve non-invasive brain stimulation-in this case transcranial magnetic stimulation. A magnetic coil is held over the person’s head and a brief pulse of current goes through the coil. This action briefly creates a magnetic field that induces a similar current in the person’s cerebral cortex. The investigators apply TMS over the motor cortex and measure the response in the electrical activity of hand muscles, recorded with electromyography. The muscle activity induced by activating someone’s motor cortex with TMS (while they are sitting at rest) provides information about the state of their motor cortex. Using variations of this technique, Block and her team can also estimate the strength of connections from sensory areas of the brain to the motor cortex to discover if these connections change when the brain is compensating for altered perception or motor control.